The reason behind that is wastewater from sinks, showers, toilets, and washing machines can be converted into valuable products with the help of researchers and unique bacteria — some of which were discovered just by chance in the 1990s. Anammox bacteria came into the research scene a lot later, and are the subject of a new research led by Daniel Noguera and Katherine McMahon, professors of civil and environmental engineering at the University of Wisconsin–Madison. The research findings have been published in the Nature Communications journal. The bacterium’s name echoes its purpose: It converts ammonium into nitrogen gas when exposed to anaerobic (oxygen-free) conditions. Both researchers and treatment plant operators are excited about these microbes as they have the potential to save a huge amount of money. Being able to remove ammonium anaerobically is pretty important because about 50 percent of a sewage plant’s operating cost is pumping oxygen into the water. Some of this oxygen is needed to remove ammonium with the conventional method. But anammox bacteria do not do their work in isolation. They belong to a community, complex like the microbiome in people’s gut that breaks down food and maintains health in multiple other ways. It is this community that was the subject of the new research. We knew very little about the role of the bacteria that coexist in anammox granules. For the first time, our study identified detailed gene expression levels in these granules. This provides important clues on what the anammox bacteria and their partners might actually be doing, and how they interact. These partners are known as heterotrophs, since they depend on the anammox bacteria —which are main producers (or autotrophs), like plants capable of photosynthesis — to convert atmospheric carbon dioxide into organic carbon. Among the most interesting results of the new research are hypotheses for the exchange of biochemical material between these two sets of microbes. The heterotrophs obtain the organic carbon they require to grow from the anammox bacteria in the form of a number of specific molecules, the researchers found during their research. In return, the heterotrophs transform nitrogen into a form that anammox bacteria need for growth. A conventional wastewater treatment plant changes ammonium, which is poisonous to fish, into nitrate and nitrogen gas. Nitrogen gas is discharged into the atmosphere, while nitrate — a key plant nutrient — remains in the treated water. Regulations on the quantity of nitrate that may be discharged differ by state, but extra nitrate results in algal blooms in natural bodies of water, reducing oxygen levels for aquatic organisms. An extra benefit of anammox bacteria, compared to conventional wastewater treatment, is that they change a larger quantity of ammonium to nitrogen gas. 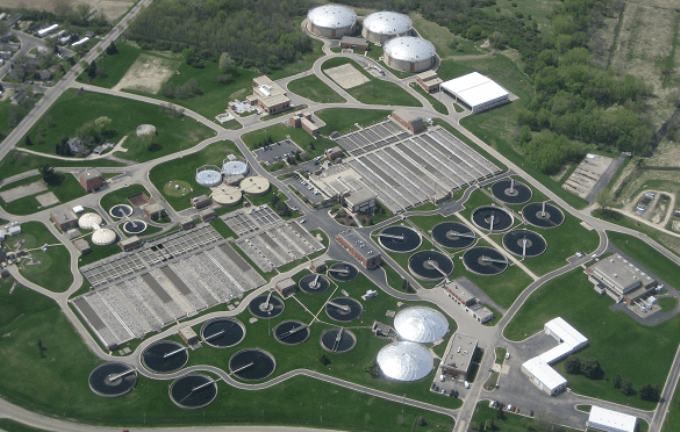 At present, treatment plant operators have to weigh the benefits of these new microbes against their implementation hurdles. Anammox bacteria grow very sluggishly, taking around seven days to double in number. Plus they require carefully monitored oxygen and temperature cycles, raising operational complexity. But anammox reactors are not the only alternative for the treatment plant of the future to extract valuable resources from wastewater. Actually, some plants already yield more energy than they need to function from the biogas that forms when organic material is broken down. Ten years from now, the typical treatment plant will probably look pretty different from today. Recovered resources may not only include clean water and energy, but also a variety of chemicals, such as fertilizers and precursors of plastics and fibers. As part of this evolution, I believe anammox reactors will soon become conventional. The UW–Madison team, which includes lead author Christopher Lawson, a graduate student in civil and environmental engineering, and Joshua Hamilton, a postdoctoral researcher in bacteriology, work in partnership on the study with Ramesh Goel’s lab at the University of Utah. This research received funding partly from the National Science Foundation (CBET-1435661, MCB-1518130) and a training fellowship from the Natural Sciences and Engineering Research Council of Canada.